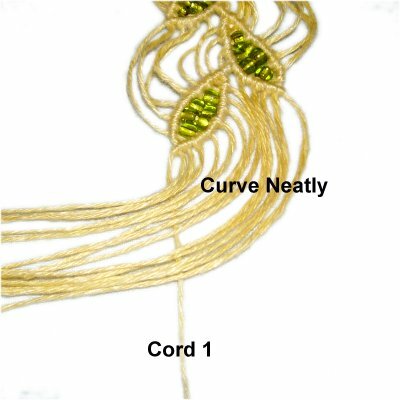 Description: Golden Leaves is a Micro-Macrame bracelet design featuring leaf shaped designs and wavy sections. It has a Buttonhole Clasp, and seed beads are used on the band and inside the leaves. 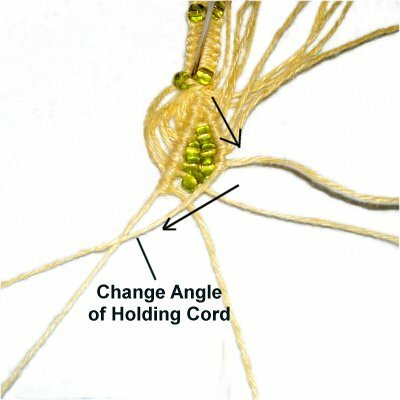 You MUST have experience in tying Double Half Hitches without having to rely on pins, since it's easier to control the holding cords in hand. Practice doing so before attempting this project. This Macrame pattern is rated Moderate, due to the use of fine material. When making a Golden Leaves bracelet more than 7 inches in size, cut the cords longer. Step 1: Arrange the cords vertically on your board, securing them at the center with tape and/or pins. The long cord should be placed to the left of the others. 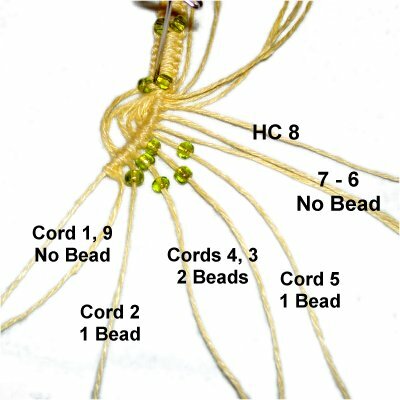 It will be the working cord for the clasp of the Golden Leaves bracelet. A good way to secure the cords is to wrap them around T-Pins and then secure them to your board with tape. << Make a counter-clockwise loop with the working cord, passing over - under the others, and over the working cord. 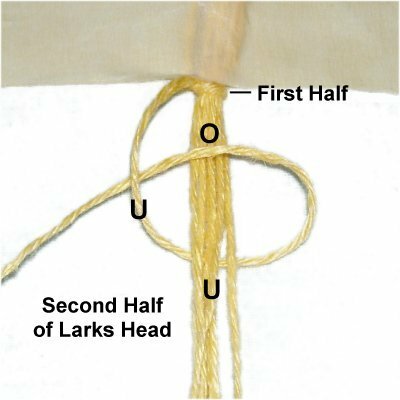 Tie several more Larks Head knots (sennit). 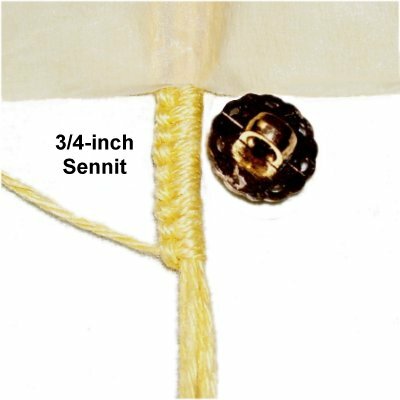 Stop when the first half of the Buttonhole Clasp measures 3/4 inches long. Turn the entire sennit around and secure it. Go back to the center and tie the same number of Larks Head knots as the first half. The only change is that you tie the knots clockwise. 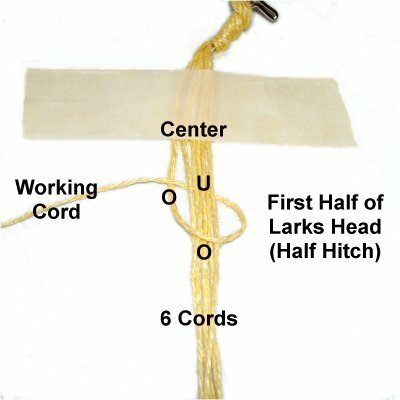 Fold the Larks Head knots to form the clasp. Check to see if the button fits through the loop. Tie additional Larks Head knots if necessary. Place the group of cords from the right on top of those from the left. 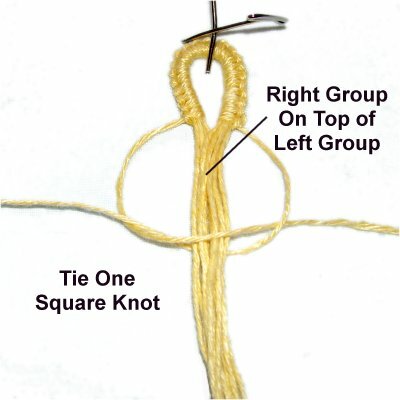 Tie one Square Knot using the two ends of the long working cord, around all the others. The center section of the Golden Leaves Bracelet should remain the size described, which is approximately 3.5 inches. To make changes to the length of this bracelet, do so in this section (band) and in the band on the other side. 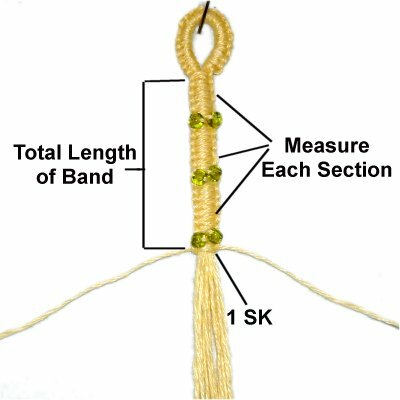 Use the chart below to determine the size of the bands, and the areas between the beads. Do not include the clasp when you measure. 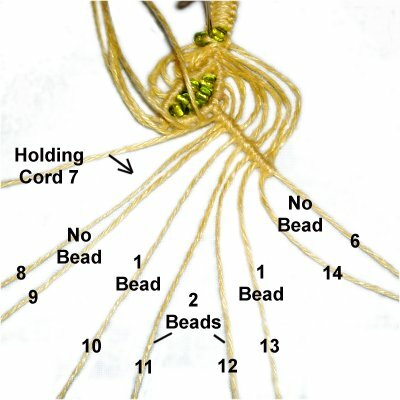 You may not be able to tie 1/2-inch sections. So adjust the size as needed. Step 2: Tie the number of SK you determined will get you the right size band for your Golden Leaves bracelet. Use the same working cords as in the clasp. 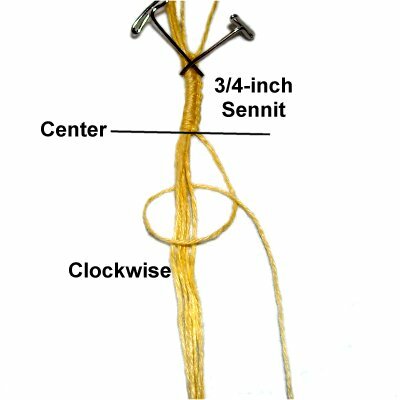 The first Square Knot you tied is part of the first section, so include it when you measure. 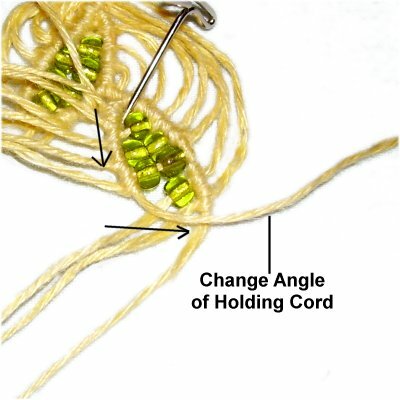 Slide one bead onto each working cord. 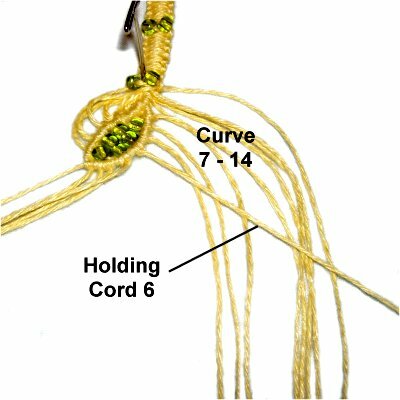 << Tie a clockwise Half Hitch with the right working cord. 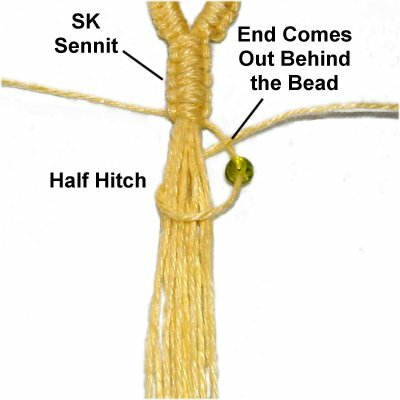 Make sure the end rests behind the bead prior to tightening. 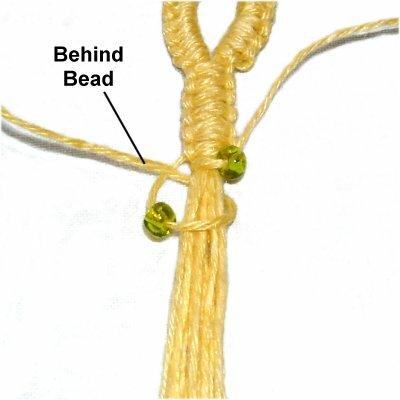 Tie the next section of Square Knots, followed by beads. Repeat this as many times as needed to get the band length you determined in the chart above. Measure each section as you progress. 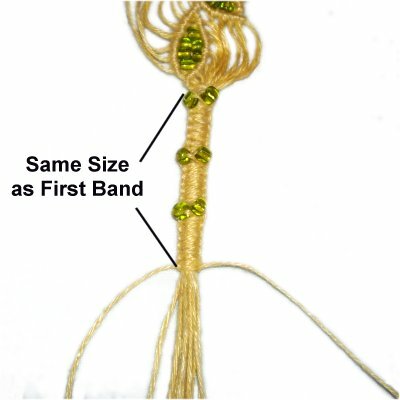 Tie one Square Knot to finish the band for your Golden Leaves bracelet. Step 3: Mentally number the cords. Divide them into two groups, with 1 - 9 on the left, and 10 - 14 on the right. Only the left 9 cords are used for the first leaf, so move the others out of your way. 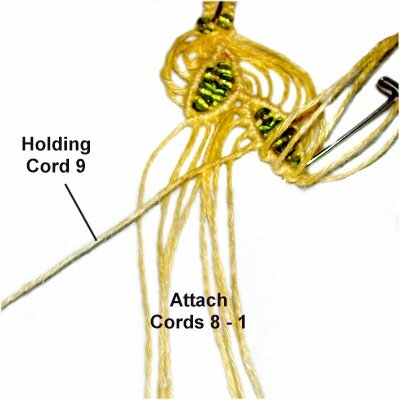 You need to decide whether to control the holding cord in hand, or to secure it, while making the Golden Leaves bracelet. I recommend holding it, so you can change the angle as needed. Use cord 9 as the holding cord. Arrange it diagonally towards the left. It should rest on top of cords 1- 8, which should curve. Attach cords 8 - 1 to it with Triple (3) Half Hitches. The loops should be made clockwise. 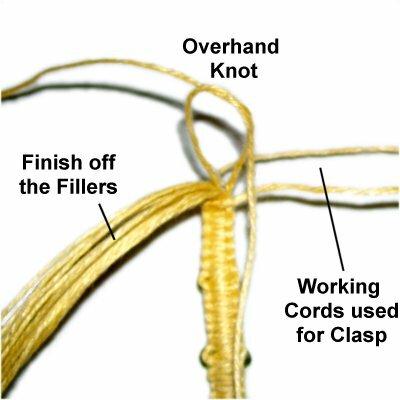 See tip below on curving the cords above the knots. Curving the cords: The first three cords should be attached with the holding cord arranged diagonally. Change the angle so the holding cord is vertical. Attach the remaining cords in that position. When you move it back to diagonal again, the working cords will have a gentle curve. Cord 8 is the new holding cord. It is the first one you attached to cord 9 (at the top of the group). 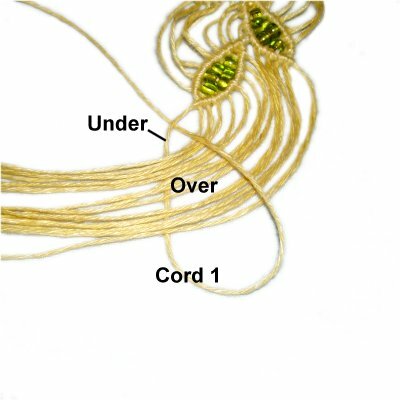 Cord 9 will now become a working cord, along with cords 1 - 7. 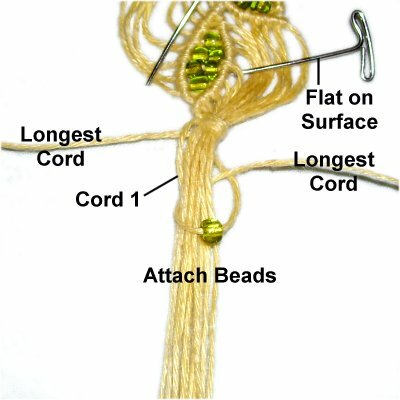 Step 3, continued: The placement of the beads is an important part of the Golden Leaves Bracelet. They help form the curved shape. The beads need to lie flat, so you may need to move them around each other or change the sizes to get the proper fit. Arrange holding cord 8 on a diagonal angle to the right. Attach cords 7 and 6 with clockwise Triple Half Hitches. Move it slightly to the left, curving it around the beads as you attach cords 5 - 2. Change the angle more to the left, and attach cords 1 and 9. Push cords 1 - 5 aside. Mentally number and organize the remaining cords for the next leaf. The holding cord is 6. Working cords 7 - 9 are from the first leaf. Working cords 10 - 14 were the ones not used in the previous step. Step 5: Move holding cord 6 on top of 7 - 14, on a diagonal slant to the right. Attach cords 7 - 14 to it with counter-clockwise Triple Half Hitches. Make sure they are in order, and that they curve (as in step 3). Arrange holding cord 7 on a diagonal angle to the left. Attach cords 8 and 9, with counter-clockwise Triple Half Hitches. Curve it around the beads as you attach cords 10 - 13. Change the angle to the right, and then attach cords 14 and 6. Step 6: Mentally re-number the cords. 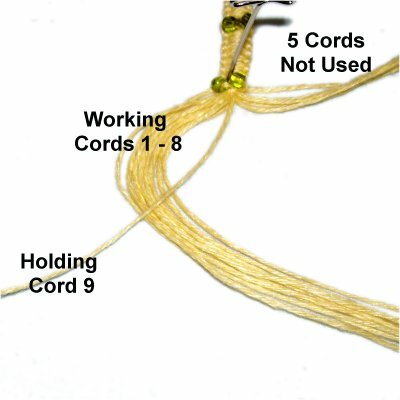 Cord 9 is used to hold the knots for the upper row of the third leaf. Move it diagonally to the left, and attach cords 8 - 1. Curve the cords as you did previously (step 3). Curve it around the beads as you attach cords 5 - 2. Change the angle to the left, and then attach working cords 1 and 9. 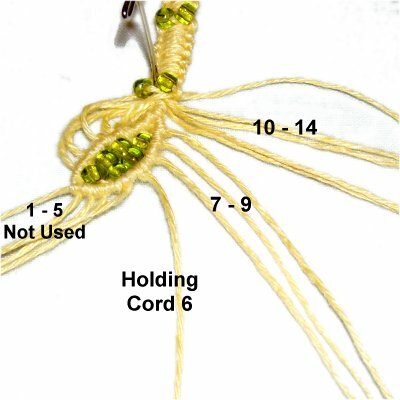 Repeat step 5 to make the 4th leaf for your Golden Leaves bracelet. Repeat step 6 to make the 5th leaf. Step 7: The final curved area is created differently than when you started the center section, since the cords are now on the inside. Arrange cord 1 vertically. Neatly curve the other cords over it, heading left (almost horizontal). Make sure they are organized and don't crisscross. Bring cord 1 over the other cords, forming a loop. Pass the end under the portion of cord 1 near where it comes off the leaf (to your left). Tighten the loop gradually and gently, taking care not to disrupt the arrangement of the other cords. You can tie a second knot if you wish. Step 8: Secure the curved area made in the previous step by placing a pin on top of the cords. Push it down so it rests flat on the surface of the project board. 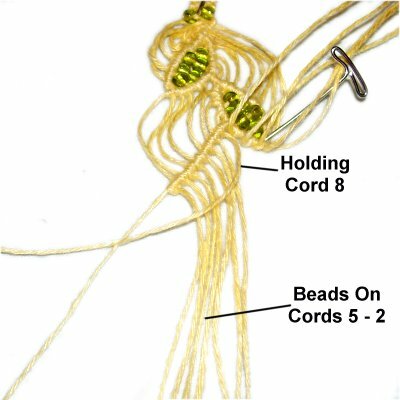 Select the two longest cords to make the second band for the Golden Leaves bracelet. Cord 1 should be brought down so it's on the inside (filler cord). Start by attaching two beads the same way you did in the first band, with Half Hitches. Create the second band, so that the overall size is the same as the first one. Keep the same measurements between the beads, so the Golden Leaves bracelet is symmetrical. There should be no bead after the third section. Step 9: Bring the two working cords you used for the band to the back of it. Tie them together with a Barrel knot. Tighten the knot evenly so it is as flat as possible, and apply glue. Do not cut them off. Finish off the fillers that the Square Knots were tied around. 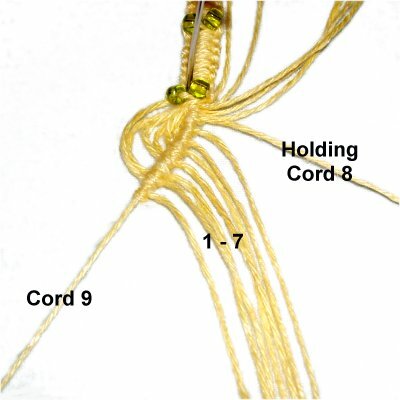 Use two at a time and tie Overhand knots, applying glue while tightening. Cut off the excess material. Be careful -- do not pull the cords so tightly that they slide through the Square Knots. Pass the two working cords from the band through the shank of the button in opposite directions. Pull the ends to bring the button all the way against the band. Make sure the Golden Leaves bracelet fits your wrist. Adjust the button placement if necessary. 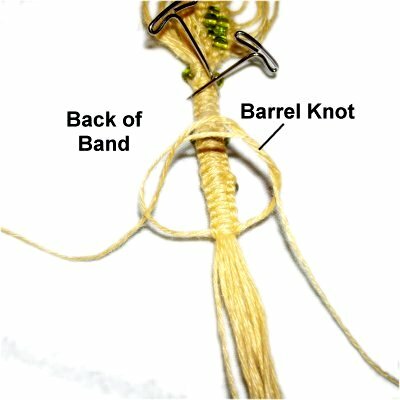 Tie off the cords with a Barrel Knot. Add glue while tightening. 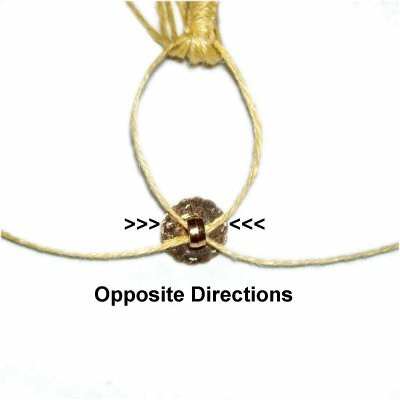 I recommend you tie a Wrapped Knot around the end of the 2nd band for the Golden Leaves bracelet, next to the button. This will help to make the area as smooth as possible, and secure the cords even better than just the finishing knots. Have any comments about the Golden Leaves Bracelet? Contact Me.